Tuck Pointing, Brick and Chimney Repair Toronto | Turnbull Masonry Ltd > Blog > Blog > How Often Should You Repair Concrete Cracks? There is no one-size-fits-all answer to the question: How often should you repair concrete cracks? That’s because it depends on the size and severity of the crack, time of year, and several other factors. While you should seal concrete at least once every three years, there isn’t a specific time frame to repair cracks. After all, concrete is going to develop cracks at different rates. 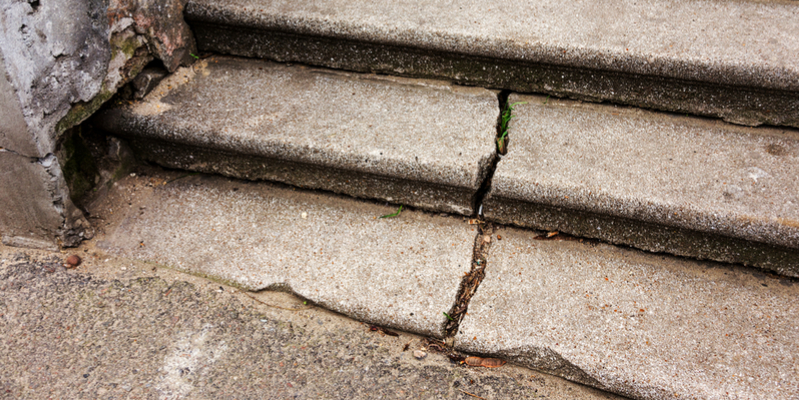 Small concrete cracks do not necessarily need to be fixed. Although, even little cracks can weaken the structure of concrete by allowing moisture inside and creating unsustainable pressure during freeze/thaw cycles. The rule of thumb for repairing concrete cracks is to address any cracks that measure larger than ¼-inch. Cracks smaller than this should not cause much issue and simply require monitoring. If cracks get larger it’s important to fix them as soon as possible to prevent worsening of damage. The good thing is that small or thin cracks are easy to fix, as long as surrounding concrete surfaces are still flat and level. Catching cracks early on can prevent a lot of headaches (and expenses) down the road. The goal is to fill cracks so that they are watertight and able to expand and contract with natural freeze and thaw cycles. Concrete may crack down to the base, this is especially common if cracks are caused by overloading of heavy trucks and traffic. If concrete cracks all the way through, you may still be able to use the existing materials. Although, in some cases, new materials are recommended. In the most severe cases you’ll need to remove concrete and sub-grade, and replace it with existing or new materials, before compacting the sub-grade and pouring the new layer of concrete on top. Patching concrete serves as a short-term fix. This may be necessary if weather does not permit a complete re-do of surfaces. Although, keep in mind that a short-term fix is just that—short term and will require more work (and money) in the future. Don’t overload surfaces – Know weight limits and don’t overload surfaces. If concrete needs to support extra-heavy loads, make sure it is properly constructed to support this. Stay on top of small cracks – Fix all small cracks that measure over ¼-inch to prevent moisture from getting into the subgrade and erosion of the sub-base. Clean concrete surfaces regularly – Clean surfaces of toxic materials like gas, animal waste, and debris. The cleaner concrete surfaces are, the longer they’ll last without showing signs of their age. Install a Good Drainage System – A solid drainage system prevents water from pooling on concrete surfaces, something that’ll increase the risk of concrete issues. Go with Trusted Concrete Installers – Turnbull Masonry is trusted to take care of both commercial and residential projects in Toronto. We understand the importance of solid construction to support long lasting and durable surfaces. Contact us today to learn more or get a quote.